We are a leading Manufacturer of truck in motion scale from Bengaluru, India. 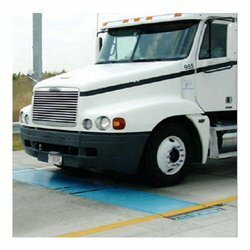 Essae Digitronics manufactures Truck In Motion Scale, popularly known as Weigh Bridges. A dedicated team for design, manufacture marketing, installation and servicing of electronic truck scales ensures impeccable focus and faster response to customer's needs. With a manufacturing license agreement with Weigh-tronix Inc., USA, Essae Digitronics is able to offer world-class products to Indian customers. The Essay Electronic Truck Scale offers the customer the same load cells that Weigh - Tronix Inc., USA uses for its scales. Heavy duty load cells and bending type weigh bars imported from Weigh-Tronix Inc. The USA give perfect accuracy & reliability for years. Heart of any electronic weigh scale, the load cell is the heavy duty bending beam type load cell. The simple, compact design and rugged hermetically sealed construction of the load cell assure long life. Looking for In Motion Scale ?